Hi everyone - welcome to Tuesday Tips. Today I'm going to talk a little bit about Legal aspects for our "How To Start A Reselling Business" series. Before we start: if you're new to our blog series, you might want to read the earlier posts on Branding and Planning first. You might also want to read the two intro posts: Should I Start A Reselling Business? Part 1 and Part 2. When we first started looking into starting our own online business - this was pre-Etsy, long before it was common to do start one (circa 2001) - we found that there weren't too many concrete facts to be found that applied to the legal aspects of an ONLINE business. Tons of websites, e-books and "self help" guides for starting TRADITIONAL businesses, but not as much for online businesses. As such, we sort of muddled along using "advice" from forums and from our tax accountant(s). We learned quite a bit, but still have a lot to learn about it. Here's one problem: The legal aspects of starting a business exist on AT LEAST three different levels: Federal, State and County/City. Those different levels do NOT really talk to each other - there's no real communication between the groups about businesses. In addition, within the State or City level different regulations, taxes, and laws apply to different states and cities. It's AGGRAVATING, but that's how it is. All it really comes down to is that all three of these levels want a piece of your business. They want a piece of the pie for doing essentially nothing. That's all it comes down to in the end - Need and Greed. Apologies if this sounds rough or cynical, but this is simply the truth. I don't want to drag down this post by talking about how all three of these different levels have COMPLETELY dropped the ball as far as ensuring that online businesses have concrete, hard facts available to them. They've handled it TERRIBLY up to this point - that's all I have to say. It's also interesting that whenever I've sort of thrown out a question to online friends (on twitter or whatever) about the tax and legal implications of ReSelling, I've often been met with stony silence or indifference. Strange. The only conclusion I could draw from this is that either people don't like to talk about the legal/tax parts of their businesses, or they are running an illegal ReSelling business, i.e. they aren't paying any taxes. 1. You want to legally start an online business, and to the best of your ability you want to set up the necessary legal parts and pay whatever fees or taxes are due. 2. You are starting a sole proprietorship - that is, there is no legal distinction between yourself and your business. I'm going to assume you're starting up a simple sole proprietorship. I think most folks looking to resell would be considering this business option first because it's the easiest. Remember - you can always change to a partnership, LLC, or Corporation later on. I know it seems like a huge pain when you're first starting out. You're going to be thinking - but what about this guy/gal I know online who just sells stuff using a personal Ebay account and doesn't have to go through all this trouble? That's fine, more power to 'em. But the more successful you are at reselling and the higher amount of income you take in, the more chance there is that the IRS and other entities are going to take notice. And you DO want to be successful - right? The nice thing about a sole proprietorship is that for the most part, you as an individual are legally considered the same as your business. As such, as far as the Federal legal aspect of your business, you pretty much DON'T need to apply for an EIN. When asked for this information, you just use your Social Security Number. Now, I know there are exceptions - and in cases where you don't WANT to use your SSN, you'll need to get an EIN. We've done this previously, and it's not a big deal usually. I put this as Number 0, because I don't think you'll need to get one in general. It's pretty safe to say that if you're accepting payments online as a reseller, sooner or later you're going to have to get a PayPal account. I'm going to refrain (greatly refrain!) from commenting on whether or not Paypal is a good thing or not. If you sell on Ebay, it's pretty much required. If you sell on Etsy, I would say that 9 out of 10 purchases would be through Paypal. Your own site? You can do whatever you want to, but we also have 95% of purchases on our own site through Paypal. 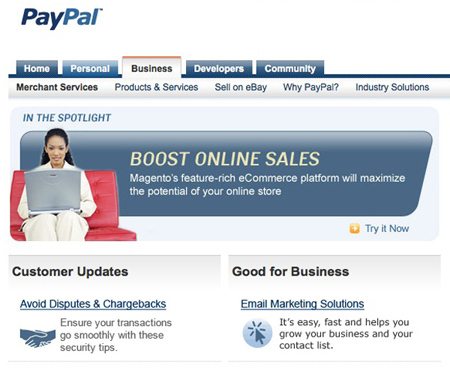 So Paypal it is - it's very easy to set up a separate business account. I would avoid using your personal Paypal account as much as possible. You'll probably also want to link it eventually to your business bank account, but the good thing is that you don't have to do that right away. One thing I do recommend is keeping the overall Paypal balance as low as possible AND keeping the overall balance in the bank account connected to your Paypal account as low as possible at all times. We've all heard the stories - it's just better to be safe when possible. I would setup your Paypal account as early as possible, just because it doesn't require much in the way of legal business stuff. This one is usually either on the "County" or "City" level. A DBA is a "Doing Business As" designation, and you'll need this in order to sell your products under a different name than your own. If you are reselling things under your own name, I guess it wouldn't be necessary. 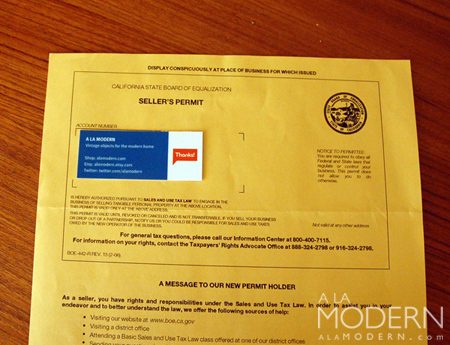 If you are reselling things under a name, like we do under "A La Modern", it's required that you register that name at the county or city level. It's probably also required in order to get a business bank account so that you can accept checks, money orders, etc. under your fictitious name. Again, there are different regulations for a DBA depending on the county, city and sometimes state. Some may not require one - you should check with your particular area if it's required. However, in MOST cases - part of the requirement for getting a DBA is Proof Of Publication in a local newspaper for 4-5 weeks. This also costs money - what the paper basically does is take out a local advertisement in a section specifically reserved for DBAs for several weeks. If you have a local paper handy, flip to the back and you'll probably see a section of businesses that are putting their DBA advertisement out there. At the completion of your advertisement running for the required time, you'll receive a piece of paper that documents it for your records. There are companies that exist that do nothing but set up DBAs. They'll actually submit the paperwork to the required county/city and then go and submit it to your local paper as well. You can search or ask around to find out which ones will do it. Because it requires some time for the ads to run, I would try and apply for your DBA very early on. I would budget 5-8 weeks total time from start to finish. Live in Oregon? Congratulations, you can skip this section. (Actually, I don't know how that works - do you still need some sort of permit to sell?). Several other states also don't have sales tax. For California, and the majority of other states, you are going to have to keep track of and remit sales taxes on your sales to customers in your particular state. Once again, different freakin' regulations apply for different states. This is annoying, because I can't tell you exactly what to do - but if your state has sales tax, chances are you're going to have to apply for a Resale Permit. In California, this is handled by the Board of Equalization. It's a fairly simple process to fill out the form, and then submit it. 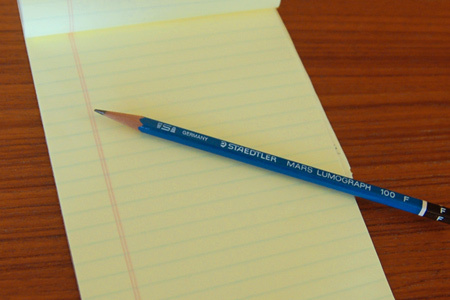 You'll get back a piece of paper like the one shown above, and you're all set to start collecting sales tax. I would also try and apply for the Seller's Permit as early as possible, because it can take a little while to get processed and for you to receive the form back. Some states are also migrating most of this process online - check with your particular state. The Sales Tax Seller's Permit may be necessary in order to sell at an antique mall, at a craft faire or at a swap meet. For internet sales, you're going to want to collect sales tax on sales made to customers within your own state. For out of state sales, the customer is usually responsible for remitting the sales tax (yeah, right). I'll probably go into this in more depth in a later post. In general, you'll remit all the sales tax collected at the end of the year back to the state, using the specified tax form. Beware - in many cases states will NOT remind you to remit the sales tax even though you're required to do so! Again, this is just another example of government dropping the ball - why wouldn't you remind someone to pay you? One of the benefits of having a Sales Permit is that when you buy inventory or supplies relating to your business (such as packing supplies), you can usually provide your resale permit number so that you don't get charged state sales tax! You should doublecheck with your particular state for rules regarding this, but it's often a valid use of the permit. If you ask businesses about their policy regarding sales permits, they'll usually know what you're talking about. This isn't necessary, but it may be a good idea to set up a business checking account for your reselling business. It lets you accept checks, money orders and other forms of payment under your "doing business as" name. It can serve as the connecting bank account for your Paypal, Ebay, Etsy and other accounts. If you're doing business under your own name as a sole proprietor, a separate bank account may not be required. However, we were advised by our tax accountant to try and keep personal and business matters separate AS MUCH AS POSSIBLE. It sort of makes sense too - it will allow you to track your expenses and income more accurately if you have everything running through a business account. In order to set up a business bank account, you'll probably need some form of paperwork - such as DBA paperwork or a business license. In our case, we were able to set up our business bank acount by providing only our completed DBA information. I'm not 100% sure, but I don't believe that simply providing a business card to a bank is sufficient to set up a bank account. I also don't know how this works with online-only banks, since mine is a brick and mortar. Again, check with your particular bank for details. Many banks will offer a "package" where you'll get a small business checking account and a credit card. For your purposes as a sole proprietor reseller, this might be a good thing to have around. For one, it allows you again to separate your business purchases from your personal ones. Unless you happen to be able to pay for everything in cash, you'll be using credit once in awhile. Having a separate credit card can be handy. Just keep a close eye on how much you spend using it! I'm actually a little bit unsure if this is required for businesses in all cities. 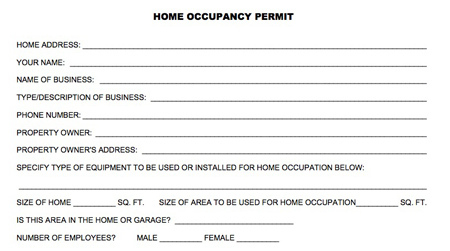 For many of the cities here in southern California, some sort of Occupancy Permit IS required in order to get a business license. What is it? Why, it's just another way for your city to get their grubby hands on your money, of course! Truthfully, you're going to have to check with your particular city to see what's required. Sometimes, they'll require a fire marshall to inspect your house - you'll even have to buy and put an approved fire extinguisher on the wall. I kid you not - this is the requirement in the city where my parents live. For me, it was just a simple form I had to fill out and submit. In general, unless it's disallowed in your city (sometimes there's weird zoning laws), it should be fairly easy to get the required permit - as long as you pay the piper. A Business License is required in order to do business within your city limits. Does it matter that you're reselling your items online? Nope, you still have to get one. Usually, whatever city you reside in is the city you'll need to get your license in. Remember that you'll also need to get the pre-requisite home or business occupancy permits as well FIRST. I'd apply for those as soon as possible, so that you'll have them when it comes time to get the business license. When we started our first online business (selling jewelry), we actually didn't bother to get a business license - because we didn't realize it was necessary! We simply didn't know we had to - again, because the idiotic city, state and federal levels didn't make this information readily available for online businesses. Nothing actually happened - until we decided to do a local craft show. We DID have a sales permit, and when it was recorded and submitted by the venue in charge of the show, we got a letter from our city telling us we needed to have a Business License. • The Federal, State and City levels all want a cut of your biz. • They want to do as little work as possible to get it. • It's difficult to get specific info that applies to YOUR business. I decided to go the route in being as legal as possible with the business. You may decide it's not necessary. Just know that if you decide to go legal, you will often need to bug your city, state, tax accountant and business friends in order to get the correct information that applies to your reselling situation. I could tell you exactly what we did in order to set our business up, but it likely wouldn't be what you need to know. When in doubt, I would seriously think about consulting an accountant who specializes in small businesses or who has experience dealing with online businesses. OK, I hope this post has been helpful to those starting up their ReSelling business. I was looking at what we had planned earlier, and it sort of makes sense that the next section would be "Recordkeeping/Taxes". This is slightly different than what we'd planned earlier. In any case, I hope to get that post up before the month is out.